After 40 years of cooking with fellow chefs and friends, Julia Child has developed a refined method for cooking her master recipes. In this cute little cookbook, she has also included variations to many of the recipes to show us all how creative cooking can be, yet how essential it is to follow the basic cooking truths. Julia was born in Pasadena, California. She then moved to Paris with her husband Paul and studied at the Cordon Bleu. After writing her first cookbook "Mastering the Art of French Cooking," in 1961, she appeared on many public television cooking shows. Judith Jones can be credited for discovering Julia Child, she is the best editor Julia Child could have ever found. She is very wise and once wrote me a nice letter to explain why my instructions in my own cookbook were too truncated. She loves the cookbooks she edits to have a personality and an easy flowing writing style. I took her advice very seriously and she has in fact improved my writing by her one small comment. It is with that said, that I can say that her influence on this book has only made Julia's writing even more wonderful. I love the fact that Julia gives her editor so much credit in the Acknowledgments section. Without great editors, most cookbooks would never make it to the publishing stage. David Nussbaum was also very influential in the writing of this particular cookbook as he was with "Julia and Jacques Cooking at Home." He helped to gather information needed for this book from Julia's books and shows. He also spent time with Julia in Judith Jones's Vermont kitchen, working out the details of some recipes. The book I am reviewing is only 127 pages, but there is also a 288 page large print edition which I applaud Julia for considering and publishing. In both books, Julia presents soups, sauces, salads, dressings, vegetables, meats, poultry, fish, eggs, breads, crepes, tarts, cakes and cookies. The index is delightfully easy to use and I love the headings, e.g., Almond(s) is in a different color than the list following it. In that way, you can find the basic categories of Apples, Crab, Soup, Cookies, etc. 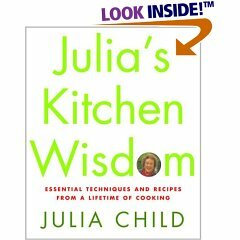 When you read the text in this cookbook, you will almost feel that Julia Child is reading to you. I can hear her voice and that is what makes this book so wonderful. Each chapter begins with a fun note (or what you might call a headnote) from Julia. The first chapter is "Soups and Two Mother Sauces." There is a recipe for "Leek and Potato Soup." Julia explains the master recipe and then gives variations of "Onion and Potato Soup," "Cream of Leek and Potato," and "Watercress Soup." What you will learn from this book is "techniques." This allows you to create your own recipes. In cooking there are certain proven cooking methods and that is what I believe Julia is trying to show you. You learn to make a white sauce and a hollandaise sauce in the first chapter. The style of the master recipes is similar throughout the book. Each one has a nice heading of a different color, ingredients are listed in the order they will be used and the instructions are easy-to-read, yet do not have numbers. The Variations for the recipes are in a paragraph style, but also have nice headings in a different color. Each page has two columns of text. In the second chapter, you will enjoy learning to make a "Basic Vinaigrette Dressing." The variations sound just delicious and there is also advice in a small block which explains how to keep your vinaigrette fresh for several days. Throughout the book you will find little blocks of text with a pink background. These must be some of Julia's secrets. This is a book you will want to read and absorb. In the third chapter, Julia has charts for blanching and boiling vegetables. She says: "When you serve fine, fresh green vegetables, you want them to show off their color." She gives some sage advice on how to accomplish this. The chapter on "Meats, Poultry and Fish" is an introduction into sautéing, broiling, roasting, stewing, braising, poaching and steaming. Then, onto French Omelets and dreamy soufflés. You will enjoy learning how to make molded dessert custards or as we know them to be, "Caramel Custards". She makes a "Classic Custard Sauce," a "Pastry Cream" and finishes the chapter on eggs with a "Classic Chocolate Mousse." Julia Child knows that you could just use a ready-made pie shell, but thinks it is a shame if you can't make one yourself. With that, I can agree. So, in her Bread Chapter, she not only explains how to make basic bread dough, she shows us how to make an all-purpose pie dough. "Cakes and Cookies" follow this chapter. This will soon become one of your favorite chapters. Now, there is one thing you will want to know when making Julia's recipes. She uses a different method for measuring flour than I do. She sifts the flour into the cups and then sweeps off the excess. That will be key to your success where noted. I personally only use that method when making pie crusts, because I create my recipes by the dip and sweep method, which is the lazy way! You will notice that in her directions, she will say 1/2 cup cake flour (sifted and measured as per the box on page 97.) I was delighted to find a recipe for "Cat's Tongues." While I had heard of these finger-shaped sugar cookies, I had no idea what they tasted like. I recommend this book to new cooks, especially because these are the master recipes I learned when I was learning to cook as a teenager in cooking class. For experienced cooks, you will enjoy the variations. This is a book of Kitchen Wisdom from American's favorite teacher of French home cooking. Kimberly Schlegel enjoys traveling as it provides her with inspiration for writing and entertaining. In The Pleasure of Your Company, she celebrates everything from luncheons to high-society bashes. Dinners, parties for pets and Wild West themes are all part of the pleasure. 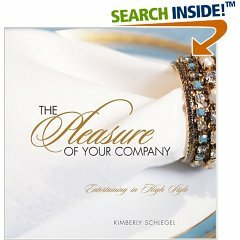 Kimberly Schlegel's mother has also greatly influenced this work with her ideas for personalizing occasions for the guest of honor. She once flew in roses from England because they were named after the Princess Michael of Kent. This was for a luncheon in her honor. The Basic Buffet, The Memorable Meal, Glamorous Gala, Special Occasion Parties and Themed Parties are all included. There are lists of possible occasions to host a party like Tea Time, Pet's birthdays, Anniversaries, Wedding Showers, Book Releases and Ladies Luncheons. Some of the highlights of the book include hostess checklists, theme ideas and how to make a guest list and send out invitations. The first party is an extravagant doggie bash complete with bone-shaped cookies with messages like "Thank you for stopping by to wag your tail." Recipes for Puff Pastry Dog Bones and Homemade Dog Biscuits are also included. A Night in Seville is shown in all its extravagance and then a party fit for a princess follows. What makes this book especially fun are the recipes included in each section and many of the delicious offerings don't require you to hunt down exotic ingredients. The fascinating chocolate coffee cups set atop a cookie saucer look delightful and delicious. You can really make the Lemon Napoleon with Fresh Fruit quite easily with frozen puff pastry. If you don't want to host your own party at home or find a location to decorate, hosting a party at a restaurant is always an option. But then again, why not host a party outside at your home in the Hamptons. The Book Party looks like a great reason to finish that novel and delicious food and music makes the party memorable. Imagine creating a party with a peppermint theme, complete with strawberries and peppermint ice cream. The Debutante Ball has an amazing display of pink rose arrangements set in the Waldorf-Astoria Grand Ballroom. Of all the party ideas in the book, the outdoor parties seemed to really get my attention and the recipes all look delicious.